A race cat in leopard outfit –that is the Bengal cat. With its spotted coat it looks like a wild predator but its nature is extremely soft and amiable. The breeding of domestic cats is not to be confused with the wild Bengal cat (Felis prionailurus bengalensis), a South East Asian type of cat. There it can be found in tropical rain forests as well as in mountains and semi-deserts. In the year 1963 the American biologist Jean Mill for the first time used the wild cat type for breeding this extraordinary domestic cat. It was her goal to breed a domestic cat that optically is similar to a wild cat but relates to humans with a kind nature. She mainly mated the wild cats with Egyptian Mouse, Abessiniers and American Shorthair. The outcome can be seen: Since the cats were shown in Europe for the first time in the late 80s, their interest community continuously grows. The impressive spot markings is not the only thing that distinguishes Bengals. They are also well known for their liking of water and thus for them water puddles, showers, water bowls, any kind of water source at all is the greatest. The Bengal cat is very active. It needs a lot of hustle and bustle and does not like to be left alone the whole day. Who would like to acquire a Bengal ought to have sufficient time and already have experience wit cats. Namely, Bengal cats are not totally simple housemates. They are not aggressive at all but have an obstinate temper. 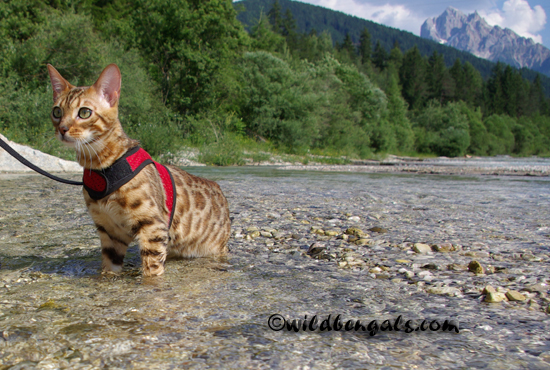 Bengals are hunters full of energy, curiosity and play instinct. At the same time they are very trusting, attentive, kind and cuddly. Special distinguishing mark: They love water. Besides, Bengals need lots of space and of course, climbing possibilities to be able to express their desire to move. The Bengal basic colors reach from light ochre to reddish brown, the markings are dark brown to black. In the markings one distinguishes between “spotted” (dotted), “rosetted” (rosettes) and “marbled” (marbleized). Snow Bengals (snows) have as basic color ivory to crème with light brown or chocolate color markings. Bengal cats are medium-sized to big, muscular and strong but never clumsy. The legs are wiry and long, which makes their body appear elegant. The Bengal cat has the most luxurious coat amongst short hair races: the coat in the ideal coat is extremely short (0,5 – 1 cm), silky and soft. Many specimens have the whole coat covered with golden shiny hair tips (called “glitter”). In this way they look like covered with gold powder. The croup is higher then the shoulders, which helps the Bengal cat to achieve an enormous bounce. The head is wide and wedge-shaped with little round ears. The eyes are big, oval and expressive. Typical are as well the flatted nose with the, especially by tomcats, obvious distinct whiskerpad, also called “cat cheeks”.